, we have yet more to share. An AT&T inventory listing sent WP Central's way potentially tells us two things about the phone that's supposed to house 41MP: it is indeed headed to the U.S. carrier and it will come in (count 'em) three colors. The site published a render yesterday that showed the new Nokia in yellow, white and black, and sure enough that's how it's listed in AT&T's line up. 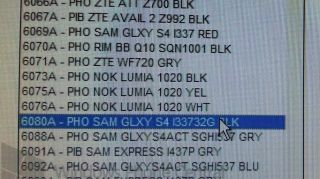 This also matches a Microsoft Store inventory spread outed July 5. Employees of Ma Bell reportedly have the phone in hand for testing, according to WPC's tipster, and a release is expected by the end of the month on the network. AT&T has been floated around as a U.S. destination for the phone before, but we should know exactly where the Lumia 1020, alternately called the Nokia 909 and Nokia EOS, will land come Thursday. Rumor has it the handset will launch in the U.K. as well, and we wouldn't be surprised if there are other locales yet mentioned on the Lumia's itinerary. The still-unconfirmed-but-pretty-much-is handset is believed to carry a 4.5-inch display, 2GB of RAM and 32GB of internal storage in addition to that 41MP camera sensor. A holder/charging pack is also said to be on deck for $70 (about UK£46, AU$76) to provide juicing on the go. We'll be in New York City to bring you the latest out of Nokia's fete starting at 8 a.m.PT/11 a.m. ET/4 p.m BST, so check back in to find out once and for all what the darn phone is called.